I’m fortunate to be retired and to spend my Canadian winters in the Italian Alps. The winters are tamer there, less snow, and a lightweight down-filled coat is all you need. Since I don’t ski, I wanted to occupy myself with other than patchwork and quilting, and so decided to offer a knitting class in the small town of St-Pierre where I live during the winter. Because knitting socks on circular needles is pretty much unheard of in these parts, I knew I would teach a knitting class and start a revolution. 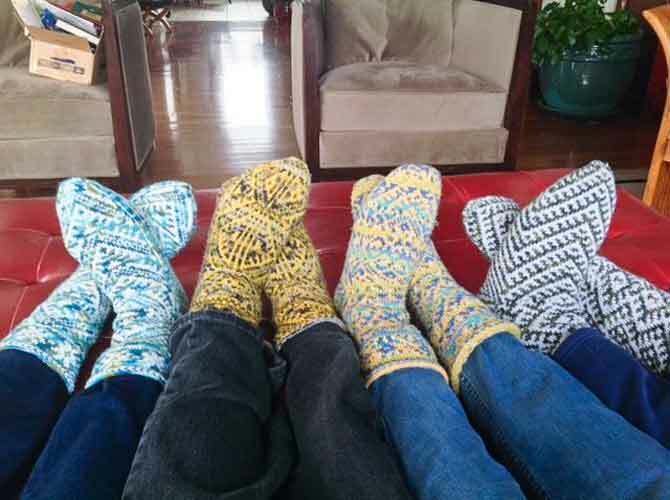 The poster read, “I’m learning how to knit socks” and featured a pair of socks I had knitted. The picture was inspired from A. Zilboorg’s Fancy Feet. It never dawned on me that this would be cause for a revolution! 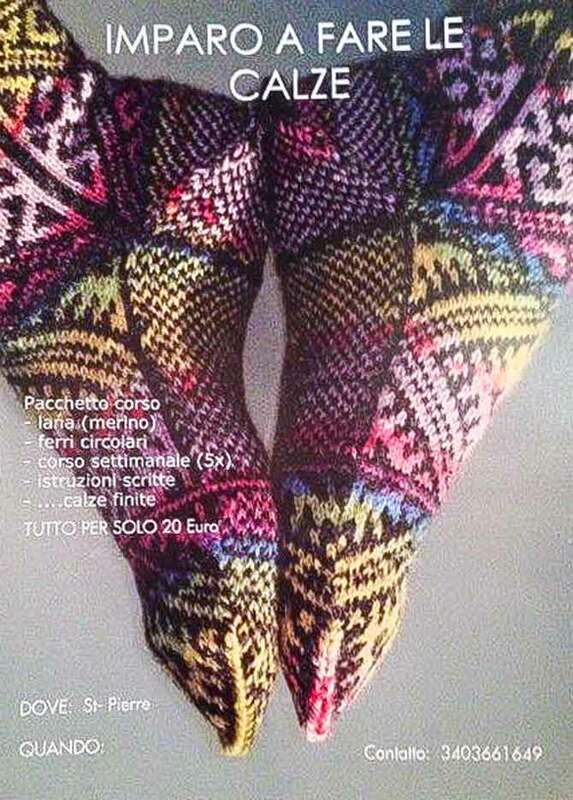 Italians have been knitting socks for millennia, top down, flap heel, one-at-a-time, with 4 double pointed needles. And that’s how it’s done! I never thought I would get anyone attending the course offered. So I asked for a ridiculous low fee which included everything: wool, needles, written instructions, videos, on-line-support, classes and the guarantee that in 7.5 hrs the attendees would leave with a finished pair of socks. Gulp. Let me explain the previous gulp. 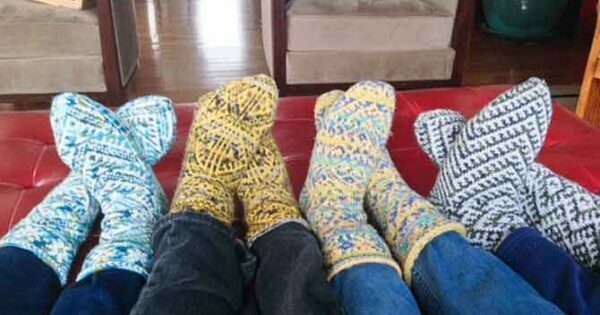 About 4 years ago, I decided I had enough of gray or left-over yarn socks that my aunt would knit. I wanted color, lots of it. But she wouldn’t hear of it. Socks, in her age-group and culture were not a fashion statement, but rather a garment to keep you warm. I had never knit a sock or anything of substance, really. I don’t consider myself a knitter – I mean I know how to knit and purl and so forth – but take a pattern away from me and I’m lost. Plus, I’m lazy. I need instant gratification. So if you knit one sock at a time, you only get 1/2 instant gratification. Not good. Family and friends got awesome socks for Christmas! Recently retired, I had all the time in the world, so I struggled through all of the socks in her book and everyone got socks for Christmas. The difference with my socks was that I used variegated Merino wool that I bought at the market in Aosta, Italy, so they were gorgeous, well…beauty is in the eye of the beholder. 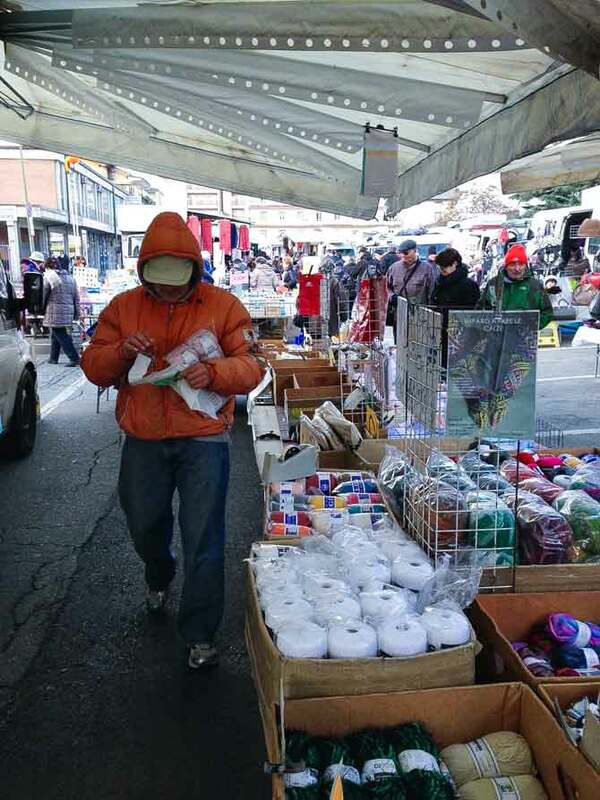 The yarn merchant at the market in Aosta, Italy. That was 3 years ago. My aunt thought I was crazy when she would see me with the two socks hanging from the circular needles. She didn’t understand how it worked. I barely understood it myself, let alone trying to explain wrap and turn in Italian to her. And then the tipping point, Melissa was not enough. I needed more. I must have emptied the shelves from books on sock knitting of the local bookstore and must have sent the librarians in a tizzy with my obscure, foreign language book requests in the city. Inter-library loans, special requests to friends abroad, used books pilgrimages, internet searches. I couldn’t get enough information on how to make socks and designs. 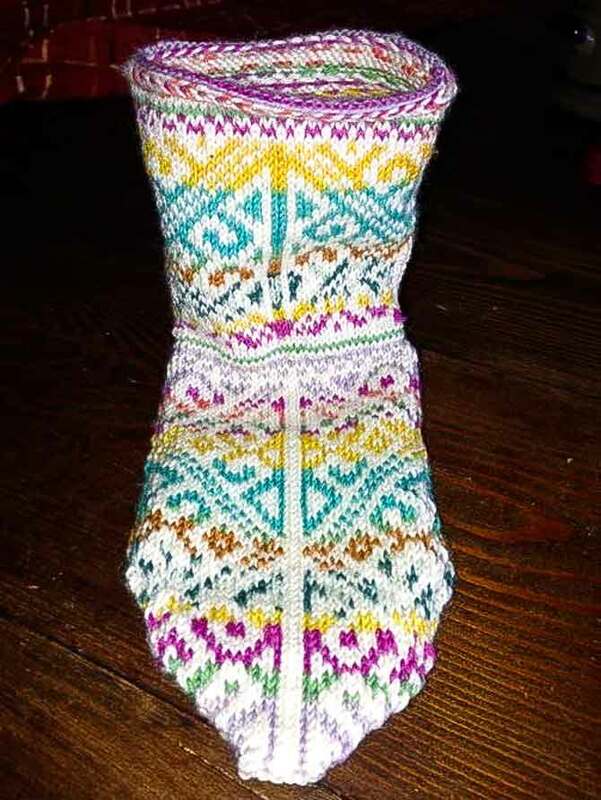 Two years ago, I launched into Fair Isle socks, concentrating on Turkish traditional patterns. I started by copying some patterns, then I was on my merry way in mixing and matching patterns, and colors. I was knitting all year round, completing friends’ and family requests. One year ago, I launched into designing my own patterns, having realized that by modifying all the pattern designs I was coming across, I was, in effect already designing my own. And that’s another story, since it splits into the creation of an e-book. So back in St- Pierre, Italy, in January 2015, the posters go up around town, at the hardware store, the numerous coffee shops, the restaurants, the grocery stores, the bakery, the gelateria. I sit by the phone a week away from course launch and received 0 phone calls.